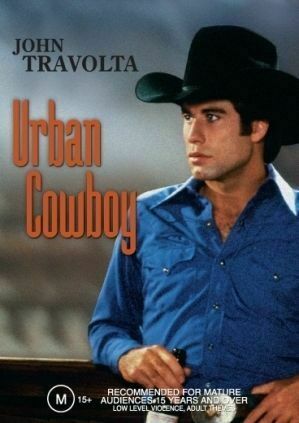 John Travolta is Urban Cowboy, breakin' hearts and bustin' mechanical bulls in one of his most electrifying film roles. By day, Bud Davis (John Travolta) toils at a Texas oil refinery; at night, he trades his hard hat for a Stetson and heads to Gilley's, Houston's most popular nightclub. There, he meets a pretty two-stepper named Sissy (Debra Winger) who thinks Bud is a "real cowboy." But Bud's got to prove it when a dangerous ex-con (Scott Glen) schemes to rob Gilley's and steal Sissy's heart. Travolta and Winger make an unforgettable screen couple in this compelling, Texas-sized look at a country-western way of life. Featuring a hit soundtrack and musical appearances by Mickey Gilley, Johnny Lee, Bonnie Raitt and The Charlie Daniels Band.